There’s no other country we have spent more time in than Thailand. Over the past five years, we lived and traveled in Thailand for nearly of those years. Best time to visit Thailand: November through April, the rainy season in Thailand is typically June-October. If you are island hopping to some of the best islands in Thailand please note not all ferry routes will be operating during monsoon season. During the rainy season it doesn’t necessarily mean it will rain all day every day. We have lived in Thailand during the rainy season and it really wasn’t that bad. With like weather anywhere in the world, it’s very unpredictable. Visa: FREE 30 days on arrival for most citizenships, click here to verify your nationality has free visa on arrival. What to wear in Thailand: The climate in Thailand is generally hot, bring plenty of warm weather clothes but pack a lightweight jacket and a pair of jeans if you visit Northern Thailand during November-January, the nights can be surprisingly cool. Wifi & Sim Cards: Free Wifi is everywhere in Thailand and getting a local data package on your phone is super cheap. The local company AIS we think is the best SIM card in Thailand, tourist packages are less than $10 for a week. It’s the easiest to get a SIM card in the Bangkok airport right after customs & immigration. Religion: Primarily Buddhist, shoulders, and knees have to be covered when entering temples in Thailand. In the south of Thailand, there is a much stronger Muslim population and it is common to see Thai women with head scarfs and mosque callings. Domestic Flights Within Thailand: Flying between cities in Thailand is super affordable and the easiest way to see as many highlights as possible. For example, $15 to fly from Chiang Mai to Bangkok. Our personal favorite airlines are Air Asia, Thai Smile, and Thai Airways. Air Asia is your standard budget airline where you pay for checked bags but in Asia, you pay based on how much weight you check, if you have a 50 lb (23kg) bag purchase the 25kg option. If you fly Thai Smile or Thai Airways bags are included for free and they have the airline snack ever a best green curry hot pocket. Other cheap airlines in Thailand: Bangkok Airways, Thai Lion Air, Nok Air, and VietJetAir.com. We always use Skyscanner to find the best prices. 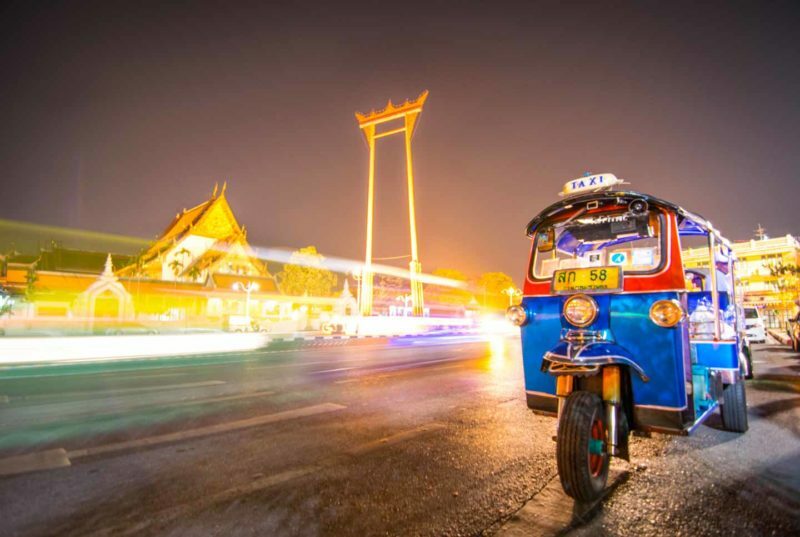 Uber in Thailand: One of the easiest ways to get around Bangkok is Uber but the hardest thing is sometimes finding your Uber in Bangkok’s traffic. Sometimes it can be challenging to explain to drivers where you want to go and then having the right change. Uber makes it so easy with it charging your credit card directly and you putting in your destination. Uber in Thailand is super cheap, when we lived in Chiang Mai it was 40 baht (less than $1.25) to take a 20 minute uber at 2 am. TIP: Set your pickup location on side streets and not the main ones as it can be impossible for them to pull over and you find them. Get $5 off Uber here. We also suggest tipping the Uber drivers something even it’s only 10baht ($0.30 USD). Taxis: Taxis are way cheaper than the Western world. On average you can sit in a taxi for an hour and spend maybe $10. Make sure to agree on either a set price or to run the meter. Sometimes taxis will refresh to run the meter and want to agree on a price. We have always found the meter is a better deal. Traffic in Bangkok can be really bad, try and avoid taxis during rush hour. Tuk Tuks: Tuk Tuks in Thailand are a blast and a common transport. Make sure to always negotiation the fare in advance. Some cities there are very few taxis and tuk tuks run the market, you’ll find this the case on islands. We suggest them for short trips from like the Grand Palace to Wat Pho or similar. Tuk Tuk scams are famous all around Thailand. Often Tuk Tuks will tell you they will give you a free ride in Bangkok but they end up bringing you to a ton of shops hoping you purchase something so they get a kickback from the shops. Ferries In Thailand: If seeing some of the best islands in Thailand on your bucket list plan on taking a few ferry rides. The ferries vary in size based on where they are going to and from. Some are large ferry boats carrying 100’s of people and others are smaller speedboats carrying less than 50 people. The ferries don’t run all the routes year-round due to the monsoon season which makes it more difficult to get to places during May-October. If you’re traveling during high season it’s best to book your ferry tickets online here in advance to secure your seat. There are several packages that include bus, shuttle, and ferry all in one ticket. Buses in Thailand: For those on a budget traveling by bus in Thailand is cheap and easy. We always suggest comparing the cost of the bus vs. flying and decide how much your time is worth. Check buses prices online here. Several tourists prefer overnight buses as this saves them a nights accommodation we, however, urge against this. Traveling on night buses in Thailand can be very dangerous, every year there are several fatal accidents. It’s just not worth it in our opinion. We’ve heard of many people who had items stolen out of their bags that were under the bus at night. Make sure to have travel insurance for instances like this and get a police report. BTS/MRT in Bangkok: Bangkok has a really good subway which is called the BTS Skytrain or MRT. Both systems connect to the Bangkok Airport Link which goes right to and from BKK airport. You will need to purchase a separate airport link pass. For both subway lines you pay based on the distance you travel. You swipe in and out so it knows exactly what you should pay. You can purchase single tickets at each station (coins only) or if you know you’ll be riding a lot that day buy a 140 baht ($4) unlimited day pass. The day pass is great not only to save you money but the time waiting in line buying passes for each trip. Train: Trains travel all across Thailand. There are several types of train classes and durations so make sure to inquire when purchasing a ticket. Train travel is popular for budget travelers to save on accommodation. For example, traveling by train from Bangkok to Chiang Mai will take 10+ hours and cost $20+. If you remember from above you can purchase a flight for $16 and be there in 90 minutes. If you’re short on time skip the train and fly to make the most of your trip to Thailand. Luxury Hotels (Over $100 night): Luxury hotels in Thailand cost a fraction of the price compared to other destinations. For just over $100 a night you can stay at the Westin in Bankok, their heavenly beds help cure jetlag. On the islands stay right on the beach with views for days. Midrange Hotels (Under $100 night): Stay in popular hotel brands like Park Plaza, Hyatt, Mercure, Holiday Inn, Aloft, and many more right in the heart of Bangkok. For even $50 a night you’ll be able to find a clean, comfortable, and centrally located hotel. Click here to search for hotels in Bangkok, Agoda.com has the most hotels and the best prices in Thailand. Airbnb: Airbnb is a great alternative to hotels especially if you’re staying longer in a city or traveling as a group or as a family. You can rent crazy gorgeous villas in the islands for a fraction of the price of hotels or penthouse apartments in Bangkok. When deciding where to stay in Bangkok make sure you understand the neighborhood the Airbnb is in so you don’t spend a lot of time getting to & from the attractions. Click here for $40 off your Airbnb. We personally don’t suggest it in Bangkok as it can be hard finding the place and getting let in. It’s great for the islands and other cities. Hotels/Guesthouses ($10 under night): There are tons of hostels in Thailand with dorm rooms for under $10 a night. If you’re in Bangkok we suggest Lub’d Siam or Lub’d Silom it’s one of the coolest hostels ever and the cleanest. It is on the “pricier” side but worth it. You don’t want the cheapest room in Bangkok. Where to stay in Bangkok – This probably one of the hardest to figure out and can really impact your trip to the city, so we’ve put together a Bangkok specific accommodation guide. 1. 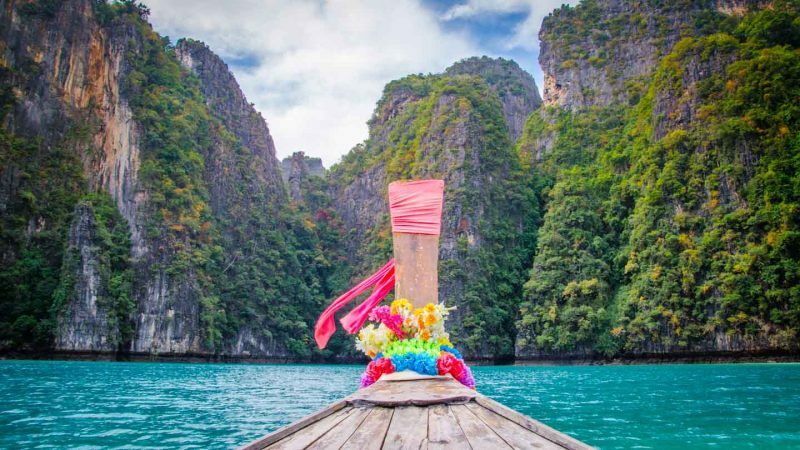 Go Island Hopping – Rent a longtail boat for the day and go exploring the Thai islands. Often you can rent a boat for the whole day for under $50. Spend your day snorkeling or on your own private beach. 2. Explore Bangkok – Most trips to Thailand start or end in Bangkok. Plan on spending 3 days in Bangkok to get a good feel for the city and see the Bangkok attractions. We also suggest going on a food tour in Bangkok so you know early on in your trip what your favorite Thai dishes are. Bangkok is a city you either love it or hate, we LOVE Bangkok. 3. Get A Sak Yant Tattoo – The best souvenir from Thailand is a Sak Yant tattoo. The tattoos are done by monks with metal rods and freehand. We each have one and they are our favorite tattoos. The tattoos are said to be magical and bless you in areas you need protection. 4. Celebrate Songkran Festival – Celebrate the Thai New Year with the world’s largest squirt gun fight. Head to Songkran in Chiang Mai or Bangkok for the most epic battles. 5. Relax in Koh Lipe – Do nothing but take in the view. Thailand’s prettiest island Koh Lipe is nicknamed “The Maldives of Thailand.” White sandy beaches and turquoise water like no other place in Thailand. Most tourists head to Phuket or Phi Phi but we always suggest the smaller lesser known islands. Make sure to check out our complete list of things to do Thailand! Curry: Thai Curry is served in many different flavors: red curry, green curry, yellow curry, Penang curry, and Masaman curry. The most popular and famous is Thai green curry. You can get curry typically with chicken, pork, beef, or vegetarian. Typically it is spicy so make sure to order it not spicy if you can’t handle the Thai spice. Pad Thai: Thailands most popular street food dish is served all over the world in Thai restaurants. Pad Thai is stir-fried rice noodles with eggs, firm tofu, green onions, dried shrimp, garlic, Thai chili peppers, and fish sauce (it sounds bad but it’s good). It’s often served with chicken. It’s hands down the most popular item for tourists. Papaya Salad: Papaya salad is nothing like it sounds like. It is not a sweet fruit salad. It’s a called som tum and “som” means sour and “tum” is from the sound it makes when all the ingredients are muddled together. It’s green papaya, carrots, fish sauce. garlic, tomatoes, chili, sugar, etc. Ingredients vary based on the vendor and what type of papaya salad you order. It’s one of our personal favorites it’s super light and healthy. You can get it at most restaurants and street food stalls. This is served spicy tell them how many if any chilis you want in your salad, we like 2 but that is a pretty high level of spice proceed with caution. Pad See Eww: Is a Thai fried noodle dish with really fresh thick rice noodles with eggs, Chinese broccoli, soy sauce, and chicken or pork if you wish. This is typically served at restaurants and not street food stalls. There are plenty of Western dishes available everywhere. There is no shortage of McDonald’s and Starbucks. If Thai food isn’t your thing you can get a pizza or burger in any city, but you really need to try authentic Thai food at least a few times – even if you don’t care for it at home. In most tourist cities you’ll find English widely spoken by most people you would interact with as a visitor. However, a few phrases will help you connect with locals and sometimes even get you a better deal while shopping in the markets or in a taxi. Polite Closing Particles: Khap (men) and Ka (women) are added at the end of many phrases in Thai. Its use denotes manners and respect. For example, women would say Sa-wad-dee Ka and men would say Sa-wa-dee Khap. It doesn’t matter the gender of the person you are speaking to, it only matters your gender to determine Khap/Ka. How Much: nee Tao Rai? We always suggest carrying travel insurance just in case something were to happen. It’s great to have some peace of mind. Our World Nomads insurance covered us when our camera equipment got damaged in a sandstorm in Namibia and when we got robbed in Malaysia. They also cover trip delays and cancelation. For only $10 a day a person it’s worth it. Amazing article!!! I’ve only been to Bangkok, but my dream is to do island hopping next time I go. I will definitely keep this for my future references 🙂 Thanks for sharing! Island hopping in Thailand is a must on your next trip. We love Bangkok, it’s a great place to start every trip to Thailand.